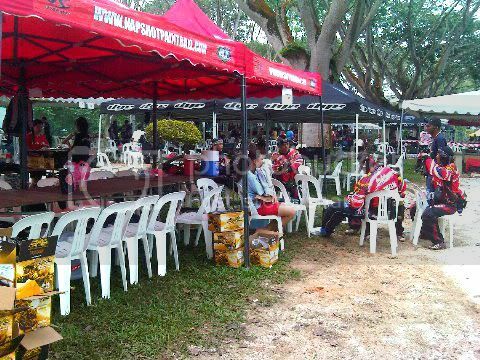 KUALA LUMPUR - The Malaysian Paintball Official Circuit (MPOC) 2011 broke some records last weekend during the first leg of the season. The event had 65 teams, as well as 16 all-women's teams from the local university, University Putra Malaysia - the most MPOC teams ever, and the most all-women's teams ever. Teams that attended the first leg had their registration fees waived, and only needed to purchase their season ID tags, which are valid until the end of the year. With teams flying in from Thailand, Singapore, and Indonesia, as well as Sabah and Sarawak, it was a truly festive event. The field at UPM was superb, with minimal mud despite heavy rain the day before the tournament. Huge trees kept the players' area cool, and players could be seen mingling in between games, or doing a spot of shopping at the Napshot, Propaintball, and Paintball Heaven booths at the entrance to the tournament village. World Cup Asia 2011 also had a promo booth to take in early registrations to the much-anticipated event. Huge trees at UPM keeping the players cool in between games. For the first time ever, the MPOC set up three fields instead of the usual two, to accommodate to the increase in teams. Sup'Air arenas were set up for Division 1, 2, and 3, while Division 4 played in a regular field. Games were hard and heavy, with teams battling to make it to the top. Top quality tournament paint like Draxxus Gold Hellfire, Premium Gold, GI Dark Sports, and Killer Paintball ensured that teams gave as good as they got. In Division 1, which plays the Race-to-4 format based on Millennium rules, team Infernal swept through the ranks, defeating team Demonz Red in the finals for the champion's spot. Teams Xfox and Xtioneers took third and fourth place respectively. Division 2 saw team Republic CMX taking the gold, followed by team Urban X with the silver. Team Red Sevens took the bronze home for Singapore, while team 3nity from Sabah took home the medal for fourth place. Team Grammaton Clerics shone in Division 3, which plays the Race-to-1 format, ploughing through the prelims all the way to the finals to emerge as the champions for D3. Red Sevens 2 (Singapore) took home the silver, while teams Kraken and GHRT Labuan took the third and fourth place respectively. It was no less intense in Division 4, which is played with mechanical markers. Team Armada Shooters took the gold home, followed by team CMX Badai with the silver, while teams Pitbull (Sabah) and Devastator took home third and fourth place respectively. There were happy faces everywhere on the podiums, where teams received trophies,medals, cash prizes, and vouchers worth up to USD$300 by DYE Precision. The total value of cash and prizes handed out for the event was over RM35,000. Over RM210,000 worth of cash and prizes will be given throughout the season. It's been a while since the MPOC has travelled outside of the capital city, so teams are now gearing up for and looking forward to the second leg of the MPOC 2011, which will be in the historical city of Malacca. For more information on the Malaysian Paintball Official Circuit (MPOC) or to register your team, please visit our website at www.palsevent.com or drop us an email at info@palseries.org.